It is still winter. Yes, I am going to complain about the weather again. Right now, we have freezing rain. School was canceled yet again. My kids will probably be going to school until the end of time to make up for all the snow days they have been having. The sun never shines so it is impossible to take decent photos. Of course, it doesn't help that the only days I have to take pictures and write blog posts are the ones where I am snowed in and the light is terrible. Oh, the hardships of being me. But, on the plus side, look at my gorgeous leather tote bag. It is even nicer in real life but that photo was the best I could manage. It smells lovely and makes me happy every time I look at it. I should have caved in and purchased it months ago. Also on the plus side, I made both my kids happy by making pancakes this morning. That meant two separate batches since my son has been put on a very restrictive diet and he can't eat normal ones. I felt like I was standing at the stove flipping pancakes forever but I am temporarily the favorite parent. I'll take what I can get. My daughter has been sorting her books and putting ones she has outgrown in the attic. This has freed up one entire bookshelf in the family room. I promptly laid claim to it and packed it full of some of my non-fiction books. Many of them have been stacked next to bookshelves in the living room so it was nice to have a home for them. It has been suggested that I should renovate my attic and turn it into my own personal library. Isn't that a lovely idea? I can picture rows of bookshelves under the eaves, a colorful rug on the floor, and a huge comfy chair by the window. If only money was no object. In the meantime, I will have to be happy with my additional bookcase. I am about halfway through Fair Stood the Wind for France. It is one of those books I have always heard of but never read. Somehow, it is not what I expected. I knew it was published right around the time of WWII so I think I expected a much more patriotic, battle-filled book. Instead, it is the story of a man whose plane goes down in Occupied France and the French family that takes him in. There is a dream-like quality to the writing that I am enjoying. I am also dipping in and out of Bound to Please by Michael Dirda. Dirda received the 1993 Pulitzer Prize for distinguished criticism. Bound to Please is a collection of his thoughts on many of the world's writers and their books. He ranges from the Bible to P. G. Wodehouse to Emerson and those are just some of the names I recognize. He will definitely broaden my horizons. I have only read the first three chapters about Herodotus, the Bible, and Ovid. I like what he says about the Bible. Like a grounding in the classics or a thorough knowledge of baseball, familiarity with the Bible invests life, whether one is a believer or not, with a kind of ballast, steadying one through moments of crisis, providing words or stories of such gravity and soul-shaking power that they become formative experiences, like running away from home or falling in love. Everyone will have his or her favorites: the aged, long-barren Sarah laughing to herself when told that she would bear a son. Abraham's near-sacrifice of his beloved Isaac ("Where is the lamb for a burnt offering?" "My son, God will provide himself a lamb"). Saul, that tragic king, confronting the witch of Endor. David's seret order to place Bathsheba's husband at the head of the battle where he is sure to be killed. The lamentations of Jeremiah ("The harvest is past, the summer is ended, and we are not saved"). The existential despair of Ecclesiastes. Job confronting the voice of God in the whirlwind. What is clear from the small amount I have read of this huge book is that Dirda has a deep love of literature and words. I can relate to a man like that. I am sure I will not run out and buy every book he talks about but he will make me appreciate it for what it is even if it isn't for me. That is the work of a true literary critic. Winter also makes me want to re-read old favorites. I read The Unknown Ajax by Georgette Heyer for the umpteenth time last week and I have been wanting to pick up This Rough Magic by Mary Stewart. I also read Miss Mapp by E. F. Benson. I know I read it years ago but I didn't remember much beyond the basic premise. I don't think I ever read the rest of the series. Obviously, I am now going to have to do something about that. After all, I cleared the stacks of books out of my living room so now it must be time to start accumulating new ones. That is how it works, isn't it? I also am not really enjoying winter. I once loved all the seasons but I am coming to only like warm weather. Bound to Please sounds very good. I tend to really like books about books, literature and art. It is very good. I am enjoying being exposed to literature I am not familiar with. Each article is quite short which makes it easy to dip in and out of. 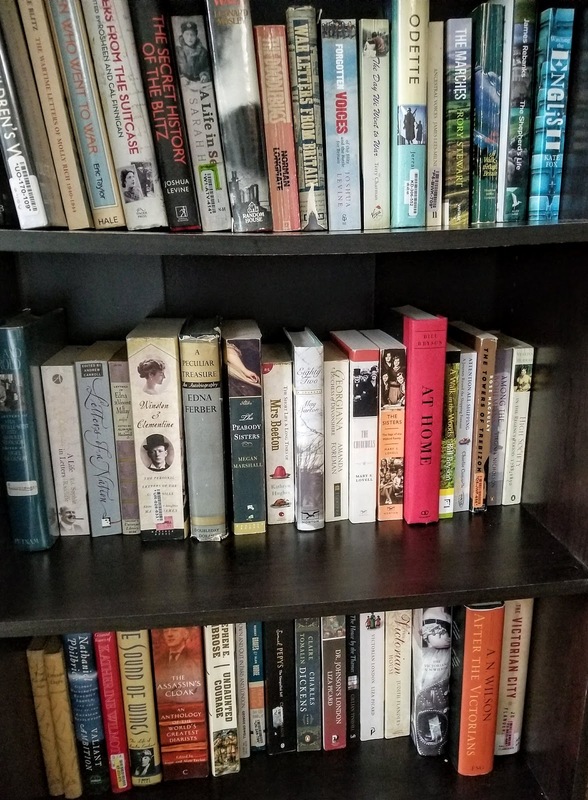 I had my own, personal library in our current house for about 2 years. Then it gradually morphed into The Lego Room. My bookshelves and books and piano are still there, they're just harder to get to some days, heh. Is that leather tote from the Etsy shop with the gorgeous refillable journals? Yes, it is! A month or so ago they had a 70 percent off sale. It was just what they call "natural character totes." They are ones where the leather is not perfect because of marks during the animal's life. I could pick the color of leather I wanted but couldn't add pockets or a zipper or anything else extra. That was fine with me. I love it and the only mark in the leather is a minute spot on the bottom where it will never be seen. It's definitely gorgeous! I must admit I'm a wee bit addicted to tote bags. Don't have any leather ones yet, though. Yet! I completely understand a tote bag addiction. I own more than any one person needs. I just came across storiarts.com and have fallen in love with several more but I am not buying any. 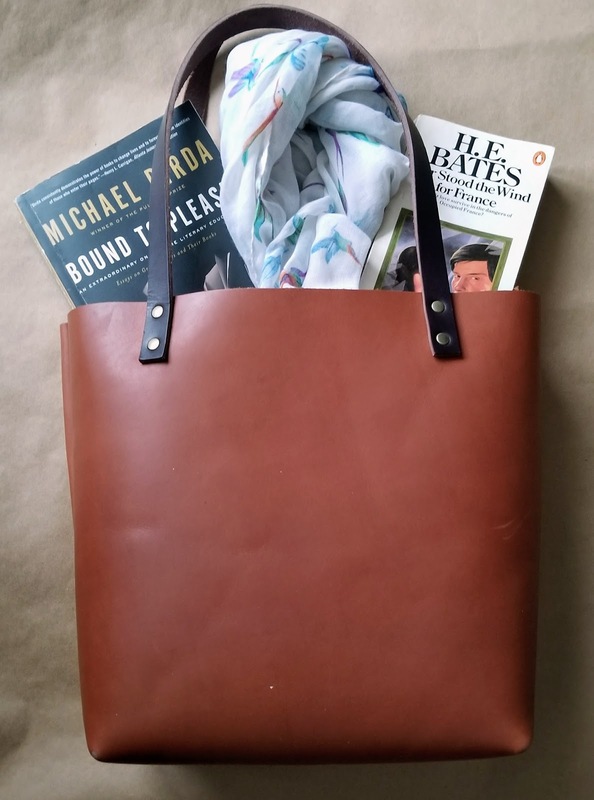 I think you need a leather tote. Did you like the journals you bought? What great books you've been reading, I almost feel jealous that you still have the rest of the Mapp and Lucia books to read. I love your bag - and the hat. I think I might possibly have read one other in the Mapp and Lucia series but if I can't remember for sure then it doesn't count. I have no idea why I never finished reading them. I recently read my first Michael Dirda book, Browsings - I think on Claire's recommendation. I had seen his books before but had gotten the impression they were literary criticism and probably way above me. I couldn't have been more wrong! I'm looking forward to more of his books. I could do with another bookshelf, and I kind of even have room for it, but I'm trying not to buy one until I reduce the TBR stacks a bit. Which isn't likely to happen soon. Oh, just buy another bookshelf! Then you will have to fill it and that gives you all the excuse you need to buy more books. You can thank me later. I have a bookshelf on my covered front porch. I put it up last summer, and haven't taken it down, so I think it's permanent! It's not GREAT for the books, I'm sure, but neither is it worse than being stuck in boxes in the attic. The Dirda book sounds lovely. I love the updated blog design too. The boxes in the attic might not be so bad if I didn't keep going up and rummaging through them trying to find a specific book. Then they get all disorganized and are piled in stacks and it just isn't good. I would love a covered front porch and I would definitely add a bookshelf to it. It sounds like a lovely place to sit in the summer.